Georges Braque, the most representatively French of this century's painters, was born in Argenteuil. He was the son of a painting contractor who was also a Sunday painter. He had his first art lessons from his father, from whom he learned to imitate marble, wood and gilt surfaces in his paintings. 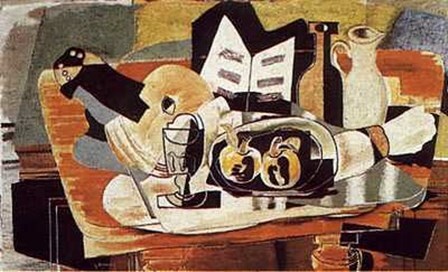 Braque then studied at the school of Fine Arts in Le Havre before going to Paris, where he studied with Bonnat and discovered African, Egyptian, and Greek sculpture at the Louvre. Braque was also influenced by the Impressionists and by his contemporaries, Matisse and Derain, whose Fauve movement he joined in about 1905. Even in this period, his works showed characteristics of his later styles, for he painted some works in monochrome, using angles as well as curves, with a flatter, more transparent pigment than that of his colleagues. By 1907, the architectural influence of Cezanne had asserted itself and Braque, with Picasso, founded the Cubist movement. He began to paint in muted colors and in the geometrical patterns, inverted perspective, and overlapping volumes associated with Cubism. Picasso and Braque worked closely together, until the outbreak of World War I, sometimes producing works so similar that the two artists themselves could not tell which one had painted a given picture if it had not been immediately signed. They also cooperated on both the analytical and synthetic stages of Cubism and on the collages that prevented Cubism from becoming overly formal: the glued-on material necessitated simplification of style. Braque was mobilized into the French Army in 1914, and a head wound he received in 1915 made him temporarily blind so that he could not paint again until 1917. He began to develop a new and more personal style, using a brighter palette and freer manner that is less angular and more luminous. By 1931 he had found a marvelous balance between intelligence and sensitivity, technique and inspiration. Braque painted a world that combines harmonious shadings of color, sinuous line, and more rounded form, with the multiple points of view and inverted space of Cubism. The most ordinary dull colors became resonant on his canvases: white is translucent; black, full of light. The resulting landscapes, figure paintings, and still lives, display lucidity, intellectuality, and restrained emotion. These qualities, as natural to Braque as his quiet manner, prompted the French government to proclaim him the "most French of all French artists of his generation.